You mean minutes, not hours, surely ? The general public are not going to take the time to try and understand characteristic curves - so focussing on doing laboratory experiments is only going to be seen as an elitist exercise hell bent on EE's justifying their existence. By all means, let's do those tests, so that we can understand the device, it's capabilities and shortcomings - but without real world testing, such experiments aren't going to mean anything to a lot of people. An engineer can follow a load curve and glean information from that - but your average member of the public won't. They want to see that a typical product runs for 'X' hours with a Batteriser and 'Y' hours without. Electronic loads are voodoo. 4. In the case of an MP3 player, specify a standard track that anyone can download and set the player to repeat this track indefinitely. This will ensure the dynamic range and spectral content of the testing track will be 100% consistent. 5. The brand and type of battery used ... and include the 'best before' or 'use by' date so we know how fresh it is. 6. Note the ambient temperature at the time of the test. If you think this is being silly - then might I point out that if you did not take similar care in the performance of a 100% electrical engineering laboratory experiment, you would have a chorus of EEs dancing on your head with hobnail boots. With the above information, you could have dozens, if not hundreds of non-engineering people able to reproduce these tests - and that is going to have far more sway in the broader community than (the perceived) bunch of nerdy engineers strutting around their labs going "hurrumph". He who shall not be named has already fired a broadside in this direction, quoting a technical description in a public environment and calling out "Who understood that?". Giving the general public things they understand is essential - and giving them the means to see for themselves will show them that electrical engineers are not trying to hide anything. We have been using sound engineering principles to prove the Batteriser will not perform as claimed. It convinces no one but other engineers which already know the Batetriser claims are BS. The product test are the most important thing to do. I don't disagree. Fair point - it's one I hadn't considered. I'm using the one song repeated on a loop over and over at fixed volume into the same headphones. A very repeatable test from a discharge point of view. I had no doubt, and agree. I was merely playing devil's advocate. Of course not, but it proves to Joe Average the product claims are BS. Someone on IGG has already seen Frank's train video and immediately wanted their money back from Batteroo. I mainly wrote what I did because I can see it coming - if there is any unknown factor in the results, Bob and his cronies will argue it in the kind of retarded way that they do (and probably use it as an excuse for forthcoming delays when they have to actually make thousands of these things). Therefore, they win as it confuses Joe Public within the first minute of the video. When people use words you don't understand, that makes them far more intelligent than you and therefore correct, right? Is it just me that wants to see these things tested using some proper equipment, and without putting them in them in a load of random battery powered devices? Possibly. Everyone with a technical clue has know batterisers were going to be worthless junk with practical application in only a few unusual cases. No amount of testing is going to change that. We knew they were going to be bad and 18 months on we get to find out how bad and so far it is pretty much as expected. No 'proper equipment' test results are going to give me a reason to use a batteriser. Lots of random battery powered device testing will give the technically clueless reason not to buy batterisers and so save their money and the planet's resources. We should probably also be telling them to make use of LSD NiMH rechargeables. Even the syyenergy7 fool on youtube seems to have discovered those. I did the train test again to fill out the missing fields in the spreadsheet, especially the extra time from dead battery, without the sleeve. So I started with a fresh battery, same brand as my first test, but this time it ran for 169 minutes, instead of 127 minutes, similar to my last test with Duracell instead of Energizer. I guess the reason might be that the train was new and it needed a few hours burn-in time. After the test, I let the battery recover for one hour, exactly as with the Batteroo test. Then it ran for another 31 minutes! Extra time with the sleeve was 4 minutes. Even if we take into account that the train might run longer after the burn-in, it is still a lot longer, albeit at a much slower speed, with Batteroo it was 2 to 5 times faster. This is expected from a boost converter. 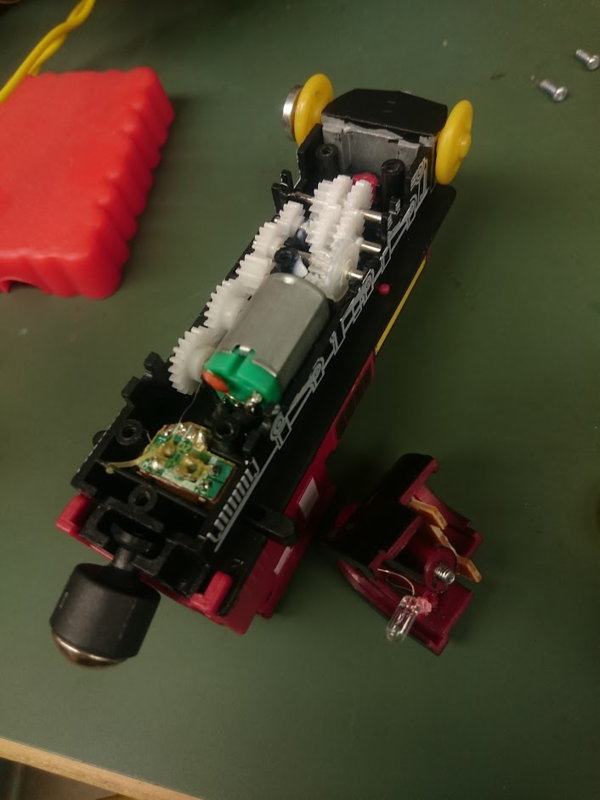 The cutout voltage for the train is difficult to measure, because it is very low and at this voltage the interaction with the high internal resistance of the battery is a problem. So I used a power supply: the train motor stops at 0.6 V and starts again when increasing to 0.8 V. It might stop when on track a bit earlier, so I used the 0.8 V limit for the spreadsheet, which is what I could measure at the battery shortly after the train stopped, too. This would explain the bad performance of the Batteroo sleeve, because efficiency at this voltage is very bad. What seems like 100 yrs ago, in the days of BBS and even pre-Viatel, and long before fancy rechargeables :-), I helped run techie BBS sites. One of the hottest topics was lists of devices that you could swap between to achieve near 100% battery drain. We had 3 categories, H M L, and ave run-time. And the battery had enough juice left afterwards to recover to 1.36V and work on full brightness in Lumintop Tool AAA torch. Also, the Thrunite torch is STILL going at 15 hours! Yet another spectacular failure of the Batteriser. Nope, HOURS. It just finally died (in a brief flash of light) and it lasted 16hrs 55min. I have timelapse footage and 2nd cam commentary of the entire thing. Samgab, regarding your edit - that is what I was wondering too, what is the definition of active? I am wondering if any type of switching power supply whether it be buck or in this case boost would be considered as active, stepping up the 1.5 VDC from the battery to the LEDs forward voltage of approximately 3 V could be considered as active. Yeah. Taking a step back from all the finer points of active vs passive, and the note that comes with the Batteroo's; in their original videos, where Frank and Bob explain why they decided to make batterisers in the first place, Frank said that his kids were playing with toys and they had to keep replacing the batteries (or that was the gist of it), so he talked to Bob about how to make a device which would mean they could use all the energy in batteries... So kids toys were the original driver behind this device. That being the case, it should be ideally suited for most kids toys, ie: toy trains, with or without a little LED. 99% of kids battery powered toys these days would have some kind of active circuitry, at least an LED with associated driver components. Edit, sorry, this is getting a little tangential from the TESTING theme of this thread. It was related to the testing of the toy trains though. Over 2000 people watched this testing live!, so no funny business. 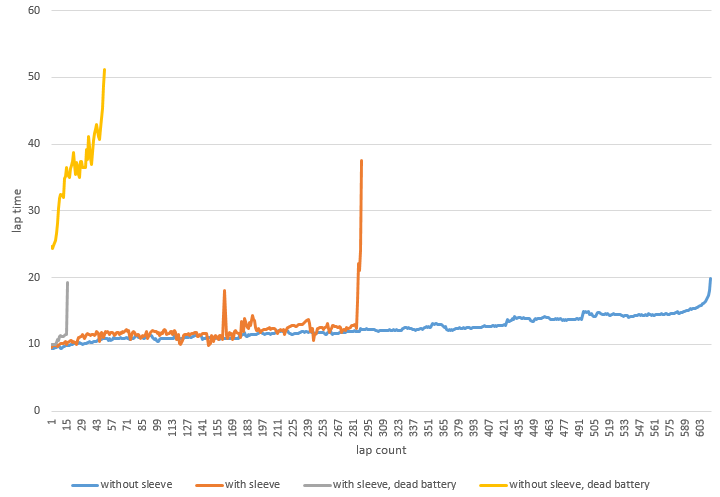 And as bonus, using the dead battery that was discharged WITH the Batteriser from new got an extra 5 laps after resting for several minutes. Of course, most of these devices, if properly designed, will come with an internal DC to DC converter already. My old Remington 6DCF-2 doesn't though. Any chance of some rough graphs or tables before you go walkabouts. Basic input/output voltages/current with a few shots from the thermal camera. It would give much more interesting data than spending hours waiting for batteries to run down for each test. That would still leave tests on noise, harmonics, shorts and there are reports of strange interactions when a number of Batterisers are used in series. It would be also interesting how much a sleeve will drain the battery without a toy. If I measured it correctly, it was about 2 microamps. It might, but...I'd expect Remington to have a clue. Battery power isn't rocket science. They didn't. No PCB at all. Just battery connection to 3V DC motor. Without the Batteriser, the train completed 3.01 rounds in one minute. With the Batteriser, the train completed 3.73 rounds in a minute. So the train had 24% higher speed with the Batteriser, but the runtime was 44% less with the Batteriser! Suggestion: If you were to upload the raw normal speed video to a web server somewhere and give Frank the link to download it, he might be able to work his software wizardry on it to obtain a graph of the lap times like he did with his test? Maybe, Frank? As expected just a reversing switch and a bulb for the headlight. Classic passive device. Wasn't the passive devices supposed to be exactly the devices the Batteriser should provide the optimal results and extend the battery life to the maximum, according to Bob. There must be something terribly wrong with your and Frank's test setup, as the Batteriser will reduce the battery life to almost half compared what it would be without the Batteriser.